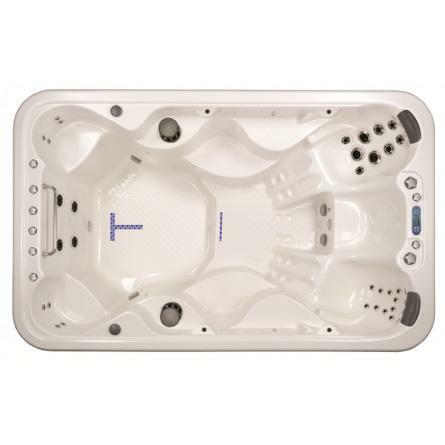 The Vita XStream Sport XS is a great price for a large 9 person hot tub with swim spa and exercise equipment options. This fantastic swim spa and hot tub combination allows you to exercise through low impact swimming or rowing as well as get the full fun of a 9 person hot tub. With two 7bhp pumps plus an additional 35 hydrotherapy jets in stainless steel, this is a value for money hot tub and swim spa hybrid built to high specifications. The Vita XStream Sport XS is available to buy from Bay Spasmin North Devon, benefit from many years of experience in the hot tub industry with a team dedicated to bringing you great after sales service as well as a full delivery and installation service. With a range of hot tubs to view in our showroom, call Bay Spas now for a no obligation discussion regarding your swim spa and hot tub needs.